Granny M's is a green micro-business that is land based. We are non profit. We keep the planet in mind with all our strategies. Minimal and recycled packaging is used. The land has no chemical use. People use a small fraction of the land base with the rest left for nature. About a third of the land is wetlands that are home to a thriving population of amphibians. Moose feed on the willow bushes there. Flocks of sandhill cranes and swans fly directly over the house and rest in our wetlands. Raptors- ravens, crows and owls nest on the treed slopes of this land. Bald eagles occasionally grace our winter feeder. We are predator friendly. Our Great Pyrennes guardian dogs and Curly horses deal wisely with bears, wolves, coyotes, wildcats. Our sanctuary status now extends to pollinators such as wild and tame bees, wasps, butterflies, moths, hummingbirds and the plants these creatures thrive on. In 2017 we were blessed with 4 swarms of honeybees arriving in "the front yard." In 2018 another 4 swarms of wild bees arrived so that we tamed another 2 hives. Our guardian rare breed American Bashkir Curly horses are responsible for the immaculate lawns, weeding, edging and contribute the stuff that composts into small hills of fertile soil. We use no tillage gardening methods that do not kill micro-organisms in soil. We live in Wet'suwet'en territory where it borders with Gitxsan tribal lands in the Pacific northwest of British Columbia Canada. We get about 10 months of what the rest of the world considers cold weather. Granny M has been gardening and farming from a healing perspective, studying reiki and energy, communing with herbs and plants for some 30 years. Life stance as healer began very early in life as a result of being parented by war damaged people. 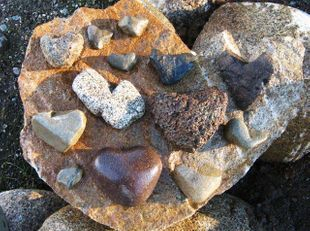 What we offer is handmade in the wild northwest with healing intent for the planet and you. 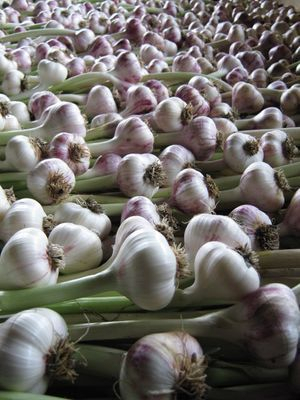 In summer our Flying Hands Farm grows garlic and onions-the premier foods for cancer prevention when grown organically. Our herbal salves and toothpaste powder are available year round. These benign products were first developed because of allergy to pain killing drugs; aversion to cancer causing additives in personal care products and then a desire to do without as many plastic containers, tubes and bottles as possible.